While nothing soothes the winter spirit more than comfort food, there is only so much cheese, pasta, soup and casseroles a girl can take. Sometimes, in the cold of winter, I long for the colorful foods of spring, summer and fall. The recipe below fits this bill and is great because you can make it any time of the year. Bonus: it is super healthy! I am such a fan of this new salsa, I can't wait to make it again. I told the boys that the jicama was "mexican apple" and they loved it. 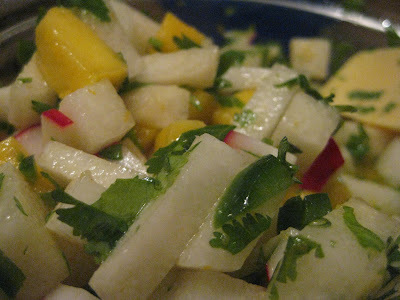 Apple and mango salsa? Yummy. I took a recipe my mom had shared with me and Sweet Pea'd it up a bit. For color, I used radish, but you could easily omit this and use red pepper. Mix together. Serve with chips. Mmm. Repeat. I make a salad that is very similar. Yum!! !